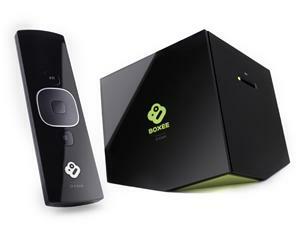 Most likely, Boxee Box by D-Link will fulfill all your streaming media and home-ripped movie-watching needs. It's cool like that. Though set-top boxes that allow you to stream web based media onto your high definition television have been around for a while now, no device seems to have a better grip on the multiplicity of multimedia better than D-Link's Boxee Box. A deceptively simple looking block of lopsided hardware, Boxee Box connects to the internet via Ethernet or WiFi. Jacked into any HDTV through HDMI, it delivers full 1080p video and Dolby Digital 5.1 Surround Sound audio from a diversity of sources. This includes mainstays like Netflix, Vimeo, and YouTube pulled down from "out there," plus loads of app-accessible specialty content, including AccuWeather, C|Net, The Escapist Magazine and The Onion. Boxee Box even delivers some live broadcast streams such as GameCenter LIVE and MLB.TV, among others (separate subscription fees may apply). Significantly, Boxee Box will also play your own private media housed on your own home network, removable SD Card or external USB hard drive. This includes just about anything you've ripped, recorded or created and regardless of file type. AVI, DivX, Flash, MPEG, MKV, WMV, ISO, you name it, Boxee can play it. An embarrassment of codecs, you might say. Same thing with audio: MP3, WAV, FLAC, Dolby Digital/Dolby True HD, no problemo. Essentially a single-minded computer heck bent on delivering media in most any form from most any source, Boxee Box simply runs circles around similar devices like the myopic Apple TV or the hodgepodge Google TV. While not much bigger than a cubed-shaped grapefruit, the Boxee Box by D-Link is definitely designed to stand alone; its shaved-bottom seats it like a post-modern art piece sinking into or emerging from the mantle, not conducive to stacking with other home entertainment components. Too, Boxee Box's Wi-Fi is pretty weak, with Netflix streams often hanging and rebuffing while a PlayStation 3 streaming Netflix right beside it has no such issues. Not a deal breaker, but an odd little shortcoming nonetheless. The included remote control for the Boxee Box is both elegant and simple. It's top face offers do-all navigation while a handy mini-QWERTY keyboard on its backside make username configuration and keyword searching a simple and inviting expereince.